I could start this off with saying, jet lag got me. I was shattered from the various time zones. I had been out all day. But no, that would be too simple an excuse. Ted has decided to start 2013 off with a bang, by becoming a convicted latte felon, and now a sock thief. And if truth be told…I had a hand in this messy affair. I had been out visiting my sister and what a drive that was. You know you’ve been gone a long time when the motor way ends and you’re still not at your destination. I just sank into the chair when I got back home, ignoring all ball tosses, all invitations to play. I had forgotten rule number one of living with a Wire Fox Terrier– being rude to a fox terrier never pays. Ted ran off somewhere. Peace and quiet at last, or so I thought. I kicked off my shoes and placed my thin dress socks inside them. I would put them away when I went upstairs. I fell asleep in the chair to wake up with Ted in my lap, bearing a very odd smile on his face. Weird dog, I thought, and toddled off to bed. At four in the morning, Ted started to stare at me. I pushed my head deep under the pillows muttering unkind thoughts. Ted started to groan. I groaned louder. But we stumbled outside into the dark garden, me grumbling… hurry up, will you. Its cold. He came running back inside and straight for the warmth of the bed. Back to sleep. But at five, he started again. Jumping off and on to the bed in an effort to get my attention. It worked. I let him out again. He came running back inside. By now I was wide awake and not enjoying this new wake me up and play game. Bleery eyed, I made a coffee. He wouldn’t settled and at 5.30, he jumped off the chair and promptly vomited. Great…..this is not going to be a good morning, I thought. I went to go get the paper towels to clean up what I thought was just going to be dog food, or some garden treat he was not supposed to have. But what on earth! It was black! I picked it up to discover it was my dress sock! I was stunned. Ted never steals socks. Eye glasses, latte’s and once in a while the odd thing off a counter top, but socks? That’s just not my Ted. I am so lucky! So lucky! If he hadn’t brought the sock up on the carpet, I would have been down at the vets for emergency surgery. I can’t even begin to imagine what could have happened to poor Ted if the sock lodged in his intestines. I was so relieved. I just wanted to hug him…but no….he was off running for the ball. I made mental promises to put away my socks forever and ever. But hugs? No time for that mushy nonsense. 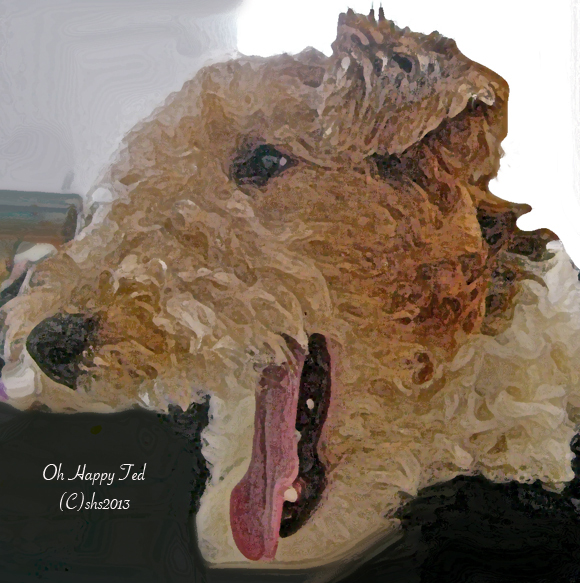 Gallery | This entry was posted in Dogs and tagged Clothing, Dogs and Socks, Dress socks, Fox Terrier, Jet lag, Socks and Hosiery, Ted, Wire Fox Terriers. Bookmark the permalink. Good grief! That’s as bad as having a toddler. Maybe worse. 🙂 So glad it came back up, and that Ted is okay. So glad to know Ted is okay. I hope he learned his lesson, though. Grey hair!! Here it comes! Thanks ted! !